I will stop and look at great length at any photograph containing a conveyor belt. 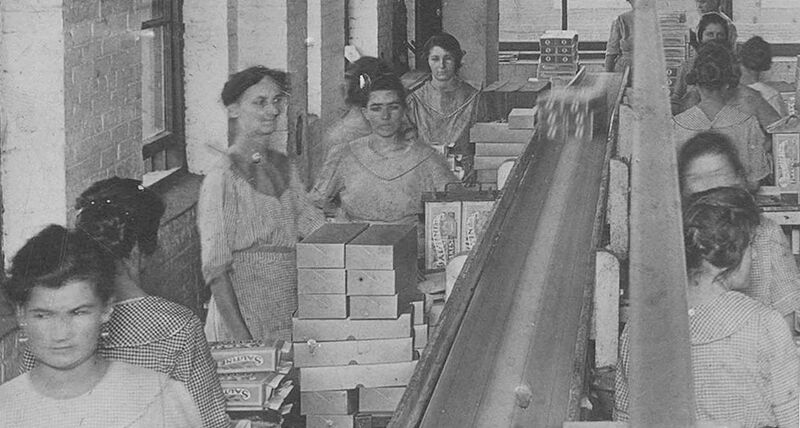 The conveyor belt in this photo belonged to the Brown Cracker and Candy Company, a large and important Dallas manufacturer and employer. 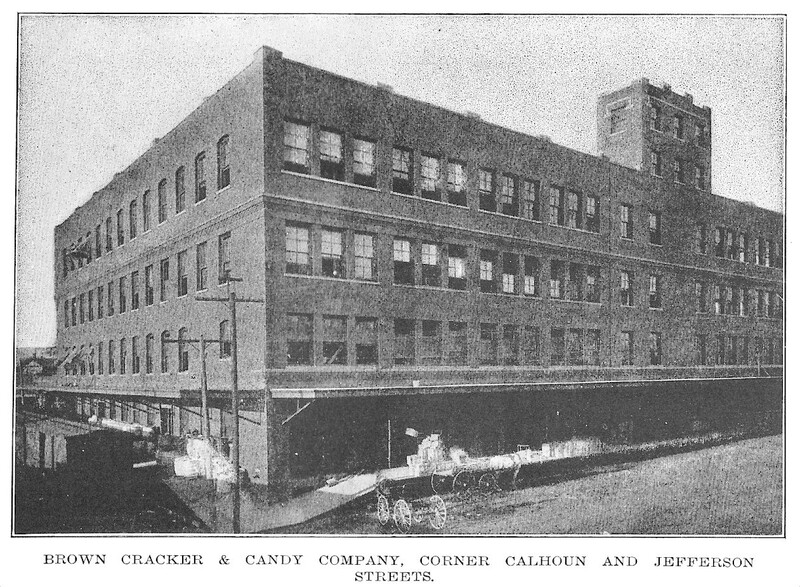 The cracker, cake, and candy factory opened in 1903 in a brand new building in the industrial area just south of McKinney Avenue (the part of town that borders downtown, now known as the West End). Best known these days as the West End Marketplace building, the structure still stands and, in fact, has just been purchased and is about to undergo renovation. 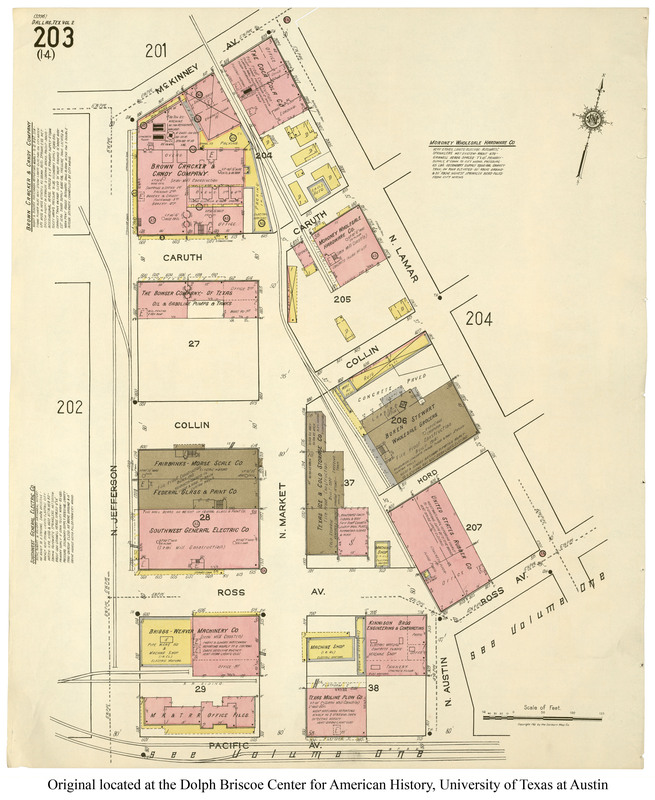 As the new building was nearing completion, the company charter was filed in April, 1903, and just a few short weeks later, the factory opened itself up for inspection by the community. 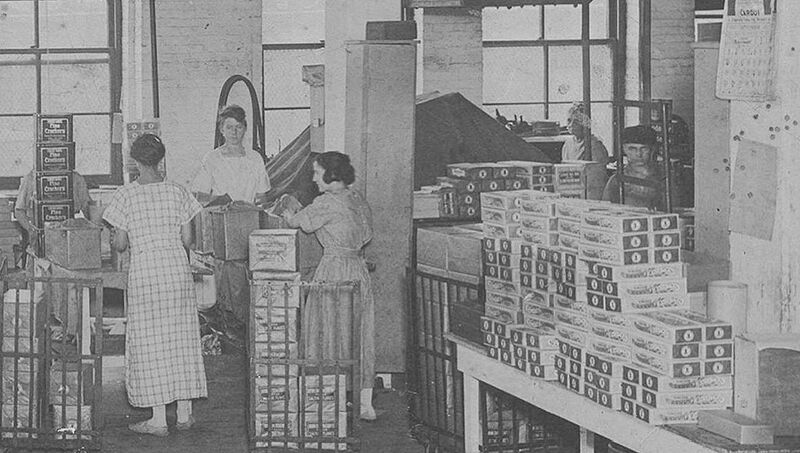 The open house was packed — several thousand people (mostly women) showed up to tour the plant, fascinated by the inner workings of the city’s newest business, a manufacturer of crackers and sweet treats. Of particular interest must have been the two giant brick ovens on the the second floor, which used more than one ton of coal daily, and the huge copper kettles used in candy making on the top floor. There were also things like chocolate dipping machines, starch machines (? ), and marshmallow heaters (I don’t know what that is, but I want to see one in action — could it have been a “marshmallow beater,” like the one seen here?). The main reason to open the factory to the public for inspection — other than as a PR-managed meet-and-greet — was to let the people see for themselves just how CLEAN the place was. 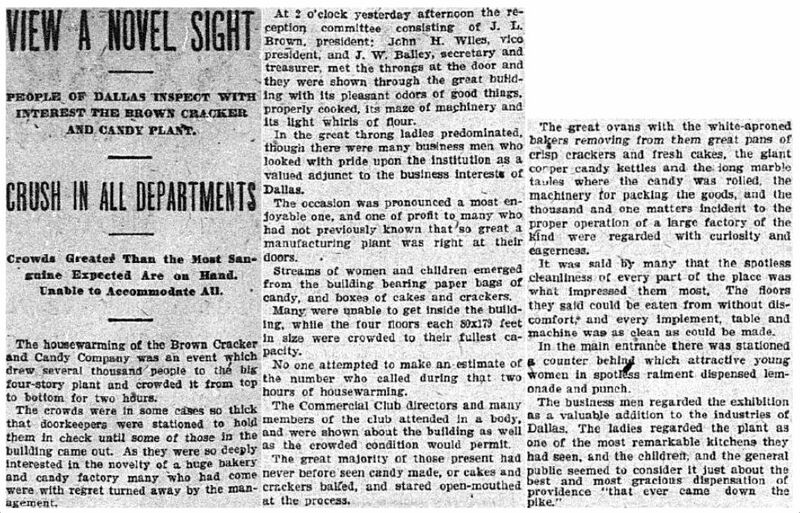 This was at a time when unsanitary food handling and manufacturing practices were much in the news (see here) — concerns which ultimately led to the enactment of the Pure Food and Drug Act of 1906 — and the above article stresses that visitors were impressed by the factory’s “spotless cleanliness” (“The floors they said could be eaten from without discomfort…”). In regard to the “cracker wrappers” pictured at the top, the company wanted to make sure everyone knew that their products were wrapped and boxed — gone were the days of shoppers dipping their (probably unclean) hands into the old “cracker barrel” full of loose, stale crackers. Let’s take a closer look at the top photo, probably taken around 1920 (click pictures for larger images). 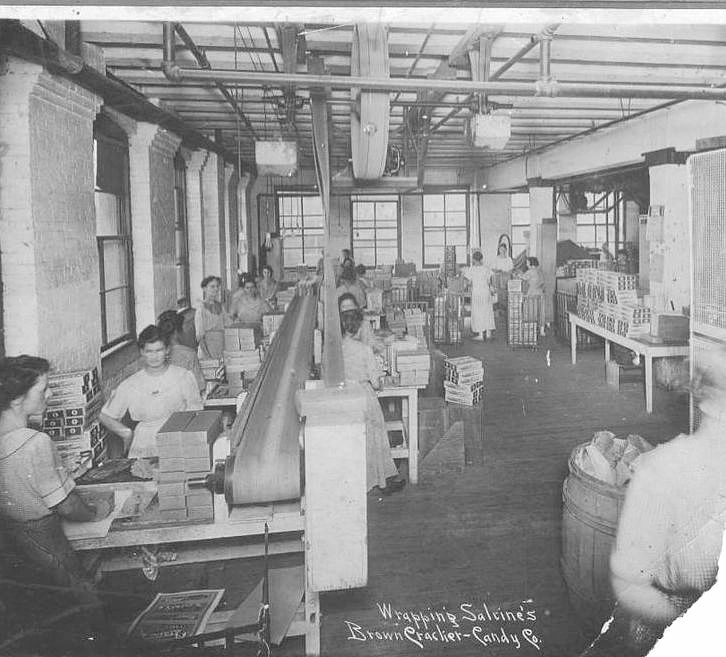 Top photo, titled “Wrapping Saltines at Brown Cracker and Candy Co.,” is from the George W. Cook Dallas/Texas image collection, DeGolyer Library, Central University Libraries, Southern Methodist University; it can be accessed here. Written on the back of the photo: “Miss Bessie Manning, 2724 Roadwood [sic] avenue, Dallas, Texas.” Bessie Manning (born Bena Manina in 1899 to Italian immigrants), began working at the Brown Cracker Co. (with a brother and a sister) around 1917 but wasn’t living on Rosewood (later North Harwood) until 1919; she left Brown in 1921 or 1922. She isn’t identified in the photo, but she is, presumably, one of the women on the left; she would have been about 20. 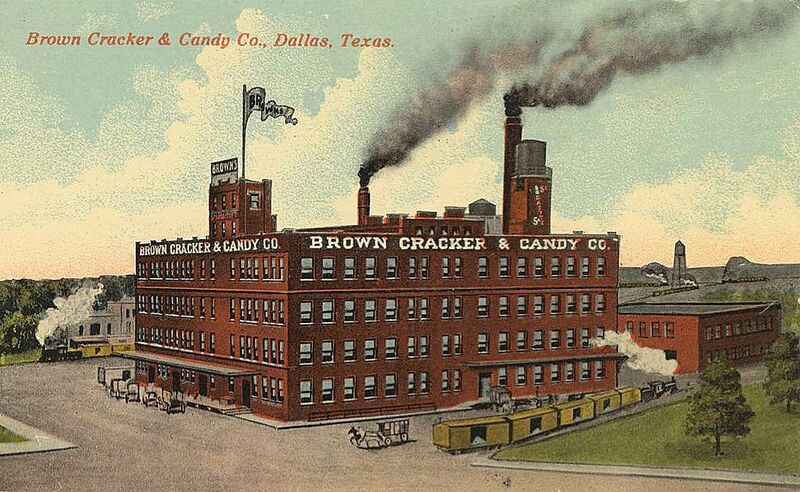 The color postcard showing the Brown Cracker Co. is also from the Cook collection at SMU; it is here. 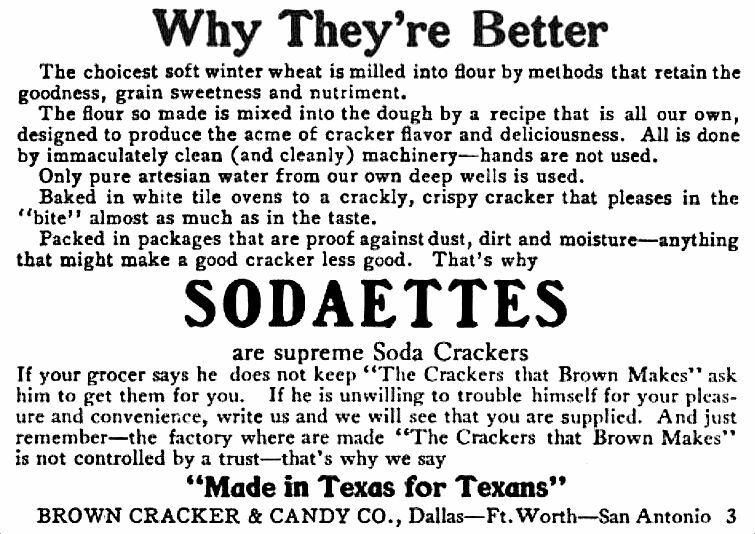 The Sodaette ad is from Library of Advertising by A. P. Johnson (Chicago: Cree Publishing Co., 1911). The photo from about 1905 is from the promotional brochure titled “Come To Dallas” (Dallas: Dorsey Printing Co., about 1905), in the collection of the DeGolyer Library, Southern Methodist University; more info is here. The photo at the bottom is from Greater Dallas Illustrated, The Most Progressive Metropolis in the Southwest (Dallas: The American Illustrating Company, 1908; reprinted by Friends of the Dallas Public Library, 1992). The informative company profile that accompanied the photo can be read in a PDF, here. All other ads and clippings as noted. 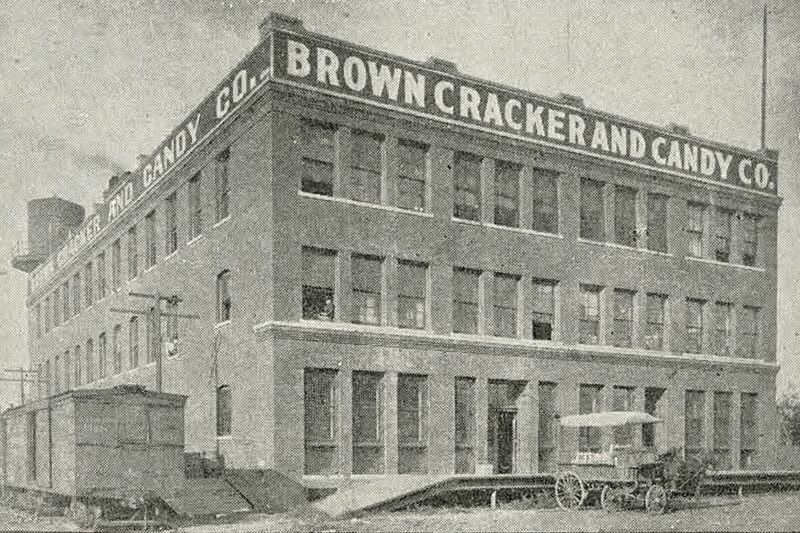 Another very informative article which details the specifics of the building and its machinery — “New Dallas Industry, Brown Cracker and Candy Company About To Begin Operations” (DMN, Apr. 6, 1903) — can be read in a PDF, here. 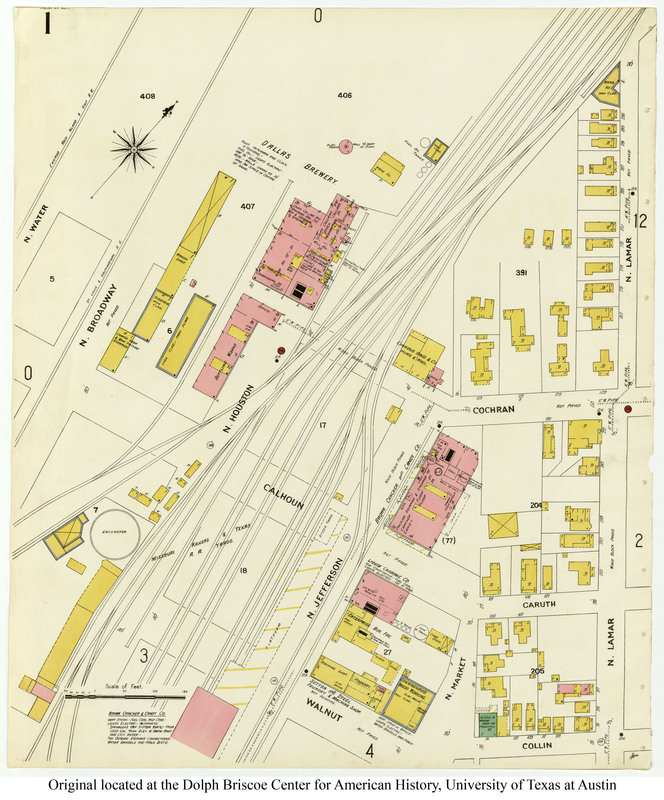 To see the Brown Cracker Company’s specs on a Sanborn map from 1905, see here; to see where it is on a modern map, see here. For current info on what’s about to happen to the building (much expanded over the years), see Steve Brown’s Dallas Morning News article, here. And, yes, a teenaged Clyde Barrow apparently worked there briefly, for a dollar a day. All I can think of is how uncomfortable it must have been to work near those ovens especially in the summer — even in a nice, loose cotton dress. Definitely. It’s odd that the huge ovens were on the second floor, and the candy making was happening on the top floor. Imagine the heat that was rising through the building. Very interesting. Thanks for posting, Paula. Thanks! I almost mentioned the bawdy house stuff, but I thought I’d leave it for another post.